For more up to date local events please follow us on Meetup here!. You can also follow us on Facebook here! Monthly Meetings: Once a month on the 3rd Wednesday at 7pm we meet at the Unitarian Universalist Fellowship in Gainesville (4225 NW 34th Street). We tend to have different speakers with thought provoking humanitarian topics. Working meetings are announced by email. Social Events: Picnics, cookouts, nature walks, star parties and more. But you must be a member! Invitations go out via email. Political Action: Are you into state or local politics? Do you keep close tabs on what our elected officials are doing? Are you tired of religionists in our state legislature trying to backdoor laws to divert public funds to religious institutions? Do you like to do research, analyze facts and write? Then we need you to attend public meetings and write opinion pieces, essays and letters to the editor. Public Service:Adopt-A-Highway road clean-ups, on-going food drive for Food4Kids Backpack Program, and more. 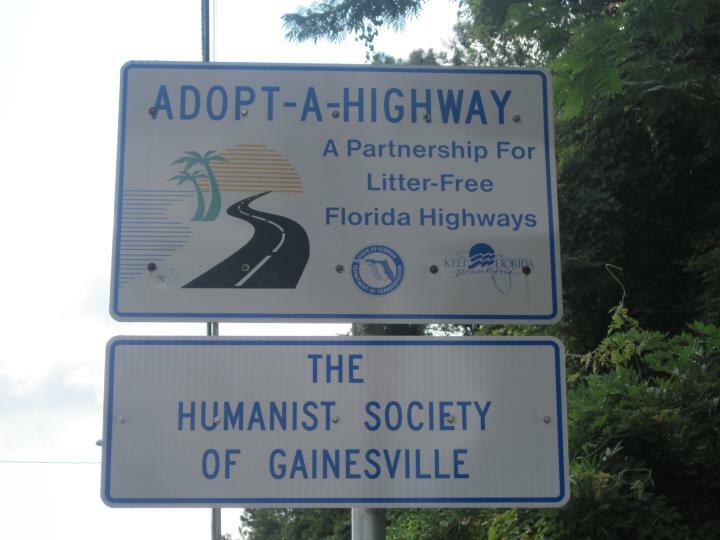 Your participation helps to show our community that humanists are good for goodness sake!